Location: Surrounding the Dockyard on east, south and most of west side. The original main entrance is on S side and there are several subsequent entrances throughout its length. Earlier C19 dockyard wall enclosing some 90 acres of the former Royal Dockyard. The Dockyard Wall was begun 1813, but it is uncertain how much is original. Walls to E and W were built c1813-4 but not finished to the S until some years later. These walls are said to have been pulled down and rebuilt 1830-2. Before 1844 the wall was indented to run to the N of the Paterchurch Tower, and 1843 plans for the Mast Pond show that the W wall ran along the present inner edge of the pond, in 1844 it was rebuilt to the present plan. The main outline is as at present on the 1858 map, but none of the minor entries are shown. Limestone rubble with ridged coping, some 3.5m high, and buttressed regularly along the inside with plain raised piers. The E wall: Begins at NE corner by Front Street, opposite the NE Martello Tower, and runs S along Commercial Row, incorporating one opening with tall ashlar piers, probably made for the railway in 1864. After some 400m is set back to W to allow space for the Market, the indented section having a low south-facing doorway of 1862 giving access to the Dockyard Chapel; there are some musketry loops. A larger entry to the chapel with cambered head was made later in C19. The S wall: Runs some 200m before curving in to meet the main dockyard gateway and lodges (listed separately). This section was repaired after 1945. The wall returns to streetline W of main entry; this 400m length has two entries towards W end, one modern, one possibly late C19 and another at SW corner, with tall gatepiers. The W wall: Runs some 300m N before abutting the corner of former Pater Battery. One blocked arch through from Mast Pond. Formerly the wall continued behind battery to Carr Point. Situated just within Dockyard wall, some 130m E of Fort Road entry to Royal Naval area. Situated by W edge of dockyard, some 100m N of entrance from Fort Road. Situated just off foreshore at W end of road running along S wall of Dockyard. 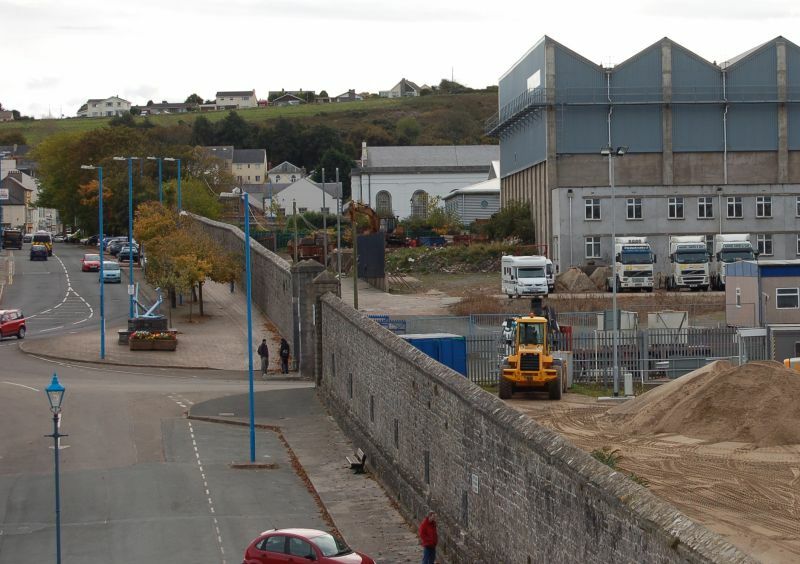 Situated behind premises occupied by Gwinnutt Ltd. some 50m SW of head of Graving Dock. Situated to west of Dockyard gates and abutting the W entrance lodge. Situated some 50m SE of Graving Dock, within Ministry of Defence enclosure. Situated at N end of Melville Terrace and across the main south entry to former Royal Dockyard.